» Get those trees away from lines! Get those trees away from lines! First sign of winter, which won’t even start for more than a month. 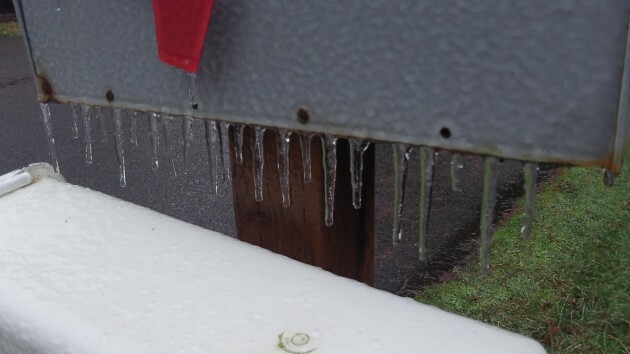 On the first day of winter weather this fall, with icicles on the mailbox and the afternoon temperature a few degrees above freezing, the man on the phone at Pacific Power says we’re one of 130 customers whose electricity is off, and a crew is working on repairs. If his prediction is right, the lights should come back on about three hours after they flickered off. I’m glad to hear it and I hope he’s right. The problem, he says, appears to be trees or branches down on the lines. So much for underground utilities; they’re no help if something goes wrong somewhere up the line, where wires are strung on poles. But tree limbs? After one little storm? After all the work Pacific has paid Trees Inc. to do just about a year or two ago? Those crews came through these parts like Sherman through Georgia, clearing every threatening branch in sight. Evidently not quite, though. You’d be surprised, the Pacific guy says on the phone, how many people tell us not to touch their trees. Tough beans, would be my answer, or words to that effect. But evidently the power company honors such injunctions from people who don’t want their trees to look deformed. I hate to say this, because who needs another law? But maybe we do need a law that says power lines have to be kept safe from overhead branches no matter what residents want. As for me, I’d rather live with an ugly tree out front than sit for prolonged periods under a blanket in a house without heat. These line people are wonderful. did you know that half your electrical bill goes to wires not electrons. Underground conduit is better but it costs about $400 a meter. Might cost a cost a lot less if a municipality just did it on their own with no urgent deadlines. Then they could put electricity cabling and Internet fibre therein and make good money renting the last mile out instead of you worry about your neighbors tree limbs.